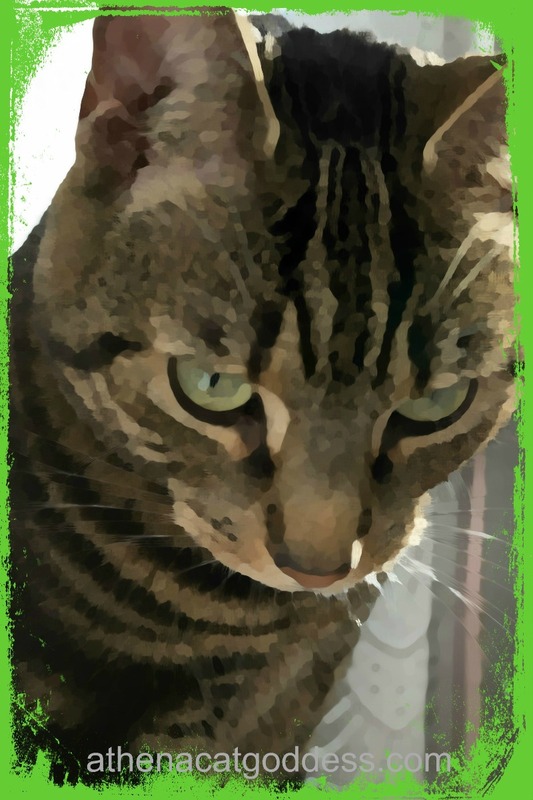 For this week's Caturday Art, Mum made this photo look like a painting in iPiccy and then added the grungy frame in befunky. It's all green for spring, and of course to match my beautiful eyes. I think my stripes look extra fabulous in this pic too. Your stripes DO look marvelous! Wow! We really like that! The green frame really does bring out those beautiful eyes. I never heard of befunky, I need to check that out. Athena! Wes LOVES the picture of yous today! It is most excellent! Your stripes looks pawsome, Athena! Very nice creation ! Looks really like a watercolor painting ! Very springy and I love the brush effect on your photo! Athena you always look so beautiful and the green does make your stripes and eyes stand out! Wonderful Athena! The green is purrrfect for you! Beautiful painting, Athena. I love the green with your eyes. Love that effect. You have done so many pretty ones. Weez nominatin' you fur an award on ow Blest Sunday posty.